Caissons on a platform are key to its operational ability. With the increasing life and integrity of an asset, these caissons can become an issue due to increased corrosion, localized damage, stress, fatigue and failure through cracking. This results in potential shut-down or high-risk, dropped-object issues. The solution to this is a swaged liner, designed bespoke to the problem caisson. It bridges the defect area, provides structural integrity, eliminates the dropped-object potential and returns the caisson back to full service. Specialist liners have been used to restore caissons back to their original depth following severance failure. Prior to a repair, Oil States also provides a caisson clean, camera survey and optional UT Inspection of the damaged caisson in confirmation of defect areas and the correct elevation position to swage the liner. Low-cost , low-impact, non-weather-dependent solution. 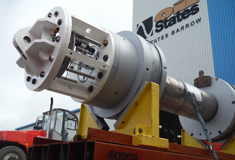 Topside-driven solution that can be carried out while asset remains in routine operation. Wide range of size/type of caissons can benefit from the swaged-liner solution. Oil States engineers integrate with the client’s onshore/offshore teams, providing extensive experience in designing, planning and implementation for these types of solutions.